Migraines or chronic headaches are very common and affect up to 40 million Americans. In fact one in four households has a family member who suffers from migraine headaches. The pain that is associated with a migraine typically lasts between 4 hours and 72 hours. Migraine headaches are usually aggravated by physical activity but can be triggered by a whole host of stimuli. They can also be associated with nausea/vomiting or heightened sensitivity to light or sound. Migraine is three times more common in women than men. Migraine is most common between the 3rd and 6th decades of life in both men and women. However, migraine affects people of all ages, including children and the elderly. Migraine, especially chronic, is a disabling medical condition that often results in missed work and lost productivity. Those with migraine are more likely to have depression, anxiety, sleep disorders, other pain conditions, and fatigue. While there are a large number of available medications to treat migraine, over half of those that are suffering from migraine stop taking medications due to poor pain relief and/or unwanted side-effects. Now there is an alternative to prescription medications and invasive procedures. This simple procedure may over time replace the need for taking migraine medications, including narcotics. The sphenopalatine ganglion (SPG) is a collection of nerves located in the back of the nose and is responsible for a majority of headaches. The SPG is also felt to be involved with cluster headaches as well as trigeminal neuralgia. Nerves fibers arising from the lining of the brain carry pain signals to the sphenopalatine ganglion resulting in a headache. Using an anesthetic to block the SPG for chronic and episodic migrainous pain has been done with good results for over one hundred years. However, getting the anesthetic to the SPG has been difficult up to this point because of a lack of a safe and reliable delivery system. In the past sharp needles and long Q tips were used with variable results and acceptance by the patient. The Sphenocath was developed to address this problem. 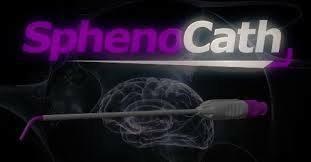 The SphenoCath is a small soft blunt ended tube that is gently inserted by a trained physician through the nose in order to reach the SPG. Initially a topical anesthetic spray is applied to the nose to make the procedure even more comfortable. Once the tube is in position, a safe anesthetic (lidocaine), is delivered slowly, achieving a blockade of the SPG. This is repeated on the other side. If you have had previous nasal surgery or trauma to the nose, we may decide to perform the procedure with x-ray guidance which would be performed in the Radiology Department at Middlesex Hospital. If no x-ray guidance is needed, the procedure takes about 15 min and is performed in the comfort and privacy of our office. In most instances, patients are able to resume normal activities within 20 minutes. The results are often immediate. An average patient may require 2-3 treatments the first year, with the effects expected to last longer between each successive treatment. The potential side effects during or after the procedure are rare and minor but may include temporary numbness in the back of the throat,mild irritation/pain to the nasal cavity, and temporary lightheadedness. Drs. Johnson, Kovalenko and MacArthur routinely perform this procedure at our office at Middletown Vein and Aesthetic Center as well as at Middlesex Hospital. The Sphenopalatine Ganglion block is covered my most insurance companies, including medicare.